A newly-identified species of spike-covered worm with legs, which lived 500 million years ago, was one of the first animals on Earth to develop armour for protection. A new species of ‘super-armoured’ worm, a bizarre, spike-covered creature which ate by filtering nutrients out of seawater with its feather-like front legs, has been identified by palaeontologists. The creature, which lived about half a billion years ago, was one of the first animals on Earth to develop armour to protect itself from predators and to use such a specialised mode of feeding. The creature, belonging to a poorly understood group of early animals, is also a prime example of the broad variety of form and function seen in the early evolutionary history of a modern group of animals that, today, are rather homogenous. The results, from researchers at the University of Cambridge and Yunnan University in China, are published today (29 June) in the journal PNAS. The creature has been named Collinsium ciliosum, or Hairy Collins’ Monster, named for the palaeontologist Desmond Collins, who discovered and first illustrated a similar Canadian fossil in the 1980s. The newly-identified species lived in what is now China during the Cambrian explosion, a period of rapid evolutionary development around half a billion years ago, when most major animal groups first appear in the fossil record. A detailed analysis of its form and evolutionary relationships indicates that the Chinese Collins’ Monster is a distant early ancestor of modern velvet worms, or onychophorans, a small group of squishy animals resembling legged worms that live primarily in tropical forests around the world. The pattern of diverse ancestors leading to relatively unvaried modern relatives has been observed in other groups in the fossil record, including sea lilies (crinoids) and lamp shells (brachiopods). However, this is the first time that this evolutionary pattern has been observed in a mostly soft-bodied group. Ortega-Hernández and his colleagues identified a remarkably well-preserved fossil from southern China, which included details of the full body organisation, the digestive tract, even down to a delicate coat of hair-like structures on the front end. Their analysis found it to be a new species – an eccentric ancestor of an otherwise straight-laced group. The Chinese Collins’ Monster had a soft and squishy body, six pairs of feather-like front legs, and nine pairs of rear legs ending in claws. Since the clawed rear legs were not well-suited for walking along the muddy ocean floor, it is likely that Collinsium eked out an existence by clinging onto sponges or other hard substances by its back claws, while sieving out its food with its feathery front legs. Some modern animals, including bamboo shrimp, feed in a similar way, capturing passing nutrients with their fan-like forearms. Given its sedentary lifestyle and soft body, the Chinese Collins’ Monster would have been a sitting duck for any predators, so it developed an impressive defence mechanism: as many as 72 sharp and pointy spikes of various sizes covering its body, making it one of the earliest soft-bodied animals to develop armour for protection. 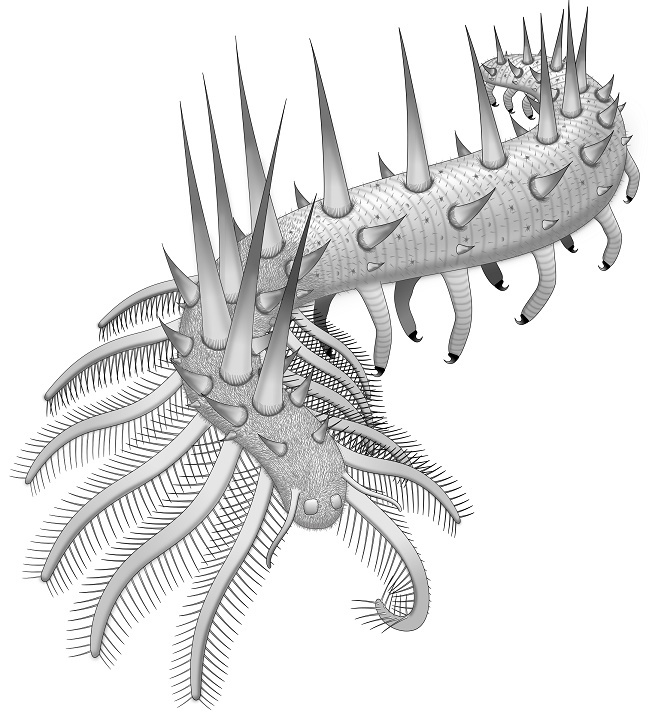 The Chinese Collins’ Monster resembles Hallucigenia, another otherworldly Cambrian fossil, albeit one which has been the subject of much more study. The fossil was found in the Xiaoshiba deposit in southern China, a site which is less-explored than the larger Chengjiang deposit nearby, but has turned up fascinating and well-preserved specimens from this key period in Earth’s history. “Animals during the Cambrian were incredibly diverse, with lots of interesting behaviours and modes of living,” said Ortega-Hernández. “The Chinese Collins’ Monster was one of these evolutionary ‘experiments’ – one which ultimately failed as they have no living direct ancestors – but it’s amazing to see how specialised many animals were hundreds of millions of years ago. The research was funded by the National Natural Science Foundation of China, Emmanuel College, Cambridge, and the Templeton World Charity Foundation.